There’s no better caricature of an ambitious but misguided entrepreneur than Tom Haverford, played by Aziz Ansari. Tom launches dozens of businesses throughout the show’s seven seasons, but audiences get a glimpse of just how dedicated he is to his latest cause in episode 13 of season three. Tom and his business partner launch a new beverage called Snake Juice and recruit their coworkers for help marketing it in the club. The guerrilla marketing tactics used in the episode are as brilliant as they are hilarious. Pawnee is full of quirky characters, but none is more beloved than local celebrity Lil Sebastian. The miniature horse is the star of the town’s annual Harvest Festival, a tradition Leslie Knope, played by Amy Poehler, hopes to begin. As you might expect, the planning of the festival doesn’t exactly run smoothly. In spite of the chaos, though, Lil Sebastian is a big enough name to draw crowds, reminding event planners everywhere of the power of a celebrity. Ron Swanson has become a symbol of rugged masculinity in the 21st century. His insistence on eating only the reddest of meats is challenged at an office barbecue. Ron’s boss Chris Traeger, played by Rob Lowe, is Ron’s opposite in every way. The health nut assures his colleagues that a healthier turkey burger topped with papaya chutney, microgreens and black truffle aioli will be the winner. 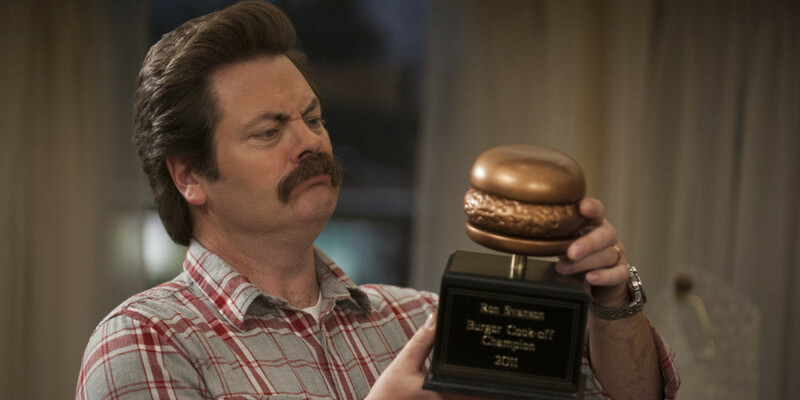 Compared to Ron’s submission to the contest, though, a “hamburger made out of meat on a bun,” the fancier option just doesn’t hold up. Chris made a classic mistake made by many excited entrepreneurs: rather than giving people the simple thing they demand, he self-sabotaged by complicating his burger. Yet another invention of the brilliant Tom Haverford, Rent-a-Swag is a business that could only exist in a town like Pawnee. Frustrated by his inability to fit typical menswear sizes, Tom makes lemonade out of lemons by renting out the pricey, child-sized threads from his closet to teen boys. Later, Tom gets several buy-out offers and eventually takes one to fund his next business venture. Rent-a-Swag goes to show that your first successful business doesn’t necessarily mean you’ve made it, but it can lead to bigger and better things. Donna, played by comedian Retta, is a relatively minor character on the show. She shines, though, when she and Tom go on their annual “Treat Yo Self” shopping spree day. Between pedicures and massages, the pair eat in their favorite restaurants and shop for luxury goods. Their inclusion of Ben, played by Adam Scott, brings an added layer of nerdiness as he treats himself to an authentic Batman costume. No matter what treating yourself looks like in your world, taking time to spoil yourself is a healthy way to de-stress. It’s easy to get wrapped up in your business as an entrepreneur, but finding some work-life balance is crucial. The ability to switch personas and handle different kinds of crowds is always useful, and no one exemplifies this power better than Ron Swanson’s alter ego, Duke Silver. Through the power of marketing, Ron transforms from a khakied-civil servant to a cool cat jazz musician. Not only does Tom discover this secret identity, he learns that Duke Silver has quite the cult following. The power of brand identity is never clearer than when Duke Silver is doing his thing! Start-up culture is mocked relentlessly in Parks and Rec’s Entertainment 720 storyline. Tom and his business partner, Jean-Ralphio, create a media conglomerate to assist clients with marketing and event planning. Tom actually quits his job with the parks and rec department to pursue the business idea, even though there’s no clear business model or revenue stream. In fact, the men are so caught up in the luxury of their start-up, they give away free iPads to folks stopping by and keep professional NBA players on retainer for entertainment. The lesson? While building a business can be exciting, anything drawing focus away from revenue is a death knell. If there’s one word to describe Ron Swanson, it’s loyal. The man is steadfast in his friendships, business and even in his eating habits. 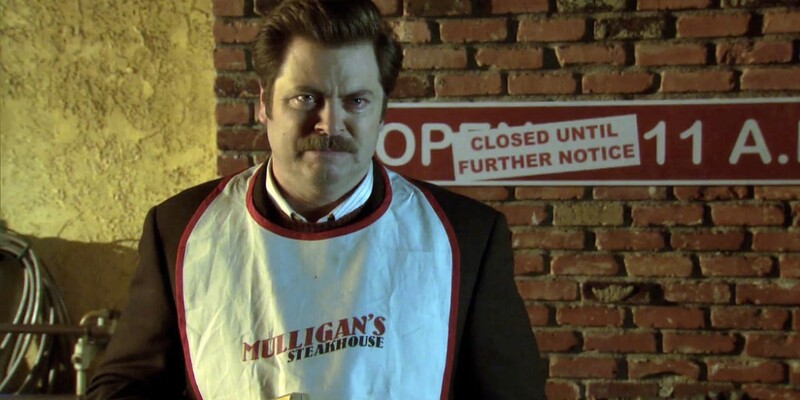 We learn early in the series about Ron’s favorite restaurant, Charles Mulligan’s Steakhouse. We later watch his heart-wrenching realization that his beloved steakhouse has been closed for health code violations. The evolution of Ron’s loyalty – and his heartbreak – shows the power of customer loyalty. Though we don’t learn the ultimate fate of the steakhouse, we’re sure it lives on forever in Ron’s heart. For every closed Mulligan’s Steakhouse, there’s a 24-hour diner that will never lock its doors. JJ’s Diner is Leslie’s favorite restaurant, so naturally, it’s featured in many important plotlines. When a tech company tries to snag the restaurant’s location out from under them, Leslie campaigns to save JJ’s. The kind of loyalty she exhibits is akin to Ron’s fervor for steak, but she’s more than willing to take an active role in saving her favorite diner. While entrepreneurs may only hope to find such loyal customers, they will be inspired by the kinds of unexpected allies awaiting them in their communities. Though not inherently business-centered, these principles remind us how simple it is to do good in our communities. While starting a small business is never easy, the power to help others and share kindness is always an option. Parks and Rec might not be an entrepreneurial bible, but it does show just how crucial it is to lead with your heart. If you’re thinking of beginning your own startup, are an entrepreneur that needs to find a little more work-life balance, or are a small business owner looking for some extra help without much additional cost, we’ve got your back. MAP Communications virtual receptionist services are perfect for entrepreneurs in Pawnee, Indiana and beyond!